It was another week and another Union bye, but there were still plenty of talking points around the league. Here’s the latest MLS recap. During his failed presidential campaign, Eric Wynalda championed the idea of changing the U.S.’s domestic schedule to better mirror the majority of leagues around the world. Supporters rightfully argued it would improve the feasibility of international transfers which would, in turn, improve MLS. It would also allow MLS to better incorporate international breaks into its schedule, since those windows are opened at times to best accommodate the best leagues. Can you name another serious domestic competition that has to deal with the World Cup starting in the middle of its season? For all of those benefits, MLS cannot switch to an Aug-May calendar. Frankly, it would be stupid. Have you been to Chicago or Toronto in the winter? Does the league really want to compete with the NFL, NBA, and NHL for attention? Yet, this weekend highlighted the “catch-22” of the MLS schedule. Most leagues shut down to facilitate friendlies between national teams before the summer’s World Cup. Because of that competition, MLS has to force games into the other international breaks. Thus, this past weekend featured a “light” round of games, but over half of the teams were still in action. Those contests came at the expense of quality. In the weekend’s six matches, 25 players were unavailable due to international call-ups. Meaningful games were played without Tyler Adams, Kemar Lawrence, Ola Kamara, Alexander Ring, Zach Steffen, and Wil Trapp. Maybe that’s why all but two matches ended in draws. Talent often produces that decisive edge. Just as baffling were the teams chosen to play during this break. Half of the 12 teams were playing their fourth game of the season. It leaves seven teams that have yet to play their third match. Philadelphia Union are one of those teams. A stop-and-go start makes it difficult to develop any early season rhythm. The Union travel to Commerce City, Co. this Saturday for their first road game of the season. 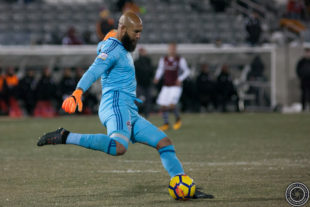 Their hosts, Colorado Rapids, are fresh off their first home match of 2018, a 2-2 draw with Sporting Kansas City. Overall, it was new head coach Anthony Hudson’s second game in charge. The former skipper of the New Zealand National team deploys a 3-5-2. Against Kansas City, only two starting outfield players were on the Rapids roster last year. Colorado jumped out to a two goal in the first eight minutes because of two reasons that defined their early season modus operandi— long balls and a high press. The Rapids attempted 82 long balls last weekend. It was actually less than the staggering 96 they played in their first match. Their average of 89 long balls per game dwarfs the next closest which is 74. It makes sense from a tactical standpoint. When they don’t connect on those passes, they still have players moving forward to transition seamlessly into their high press. While it forced Sporting Kansas City into turnovers, it also left Colorado vulnerable. With wing backs Marlon Hairston and Édgar Castillo pressing high upfield, acres of space were left on the flanks in front of the three-man back line. Each often failed to recognize when the other was forward in attack. These are the spaces the Union need to exploit. David Accam should be able to pull those center backs out of position, giving room for darting runs from the midfield. It will leave the Union one-on-one with one man, goalkeeper Tim Howard. Against Kansas City, he looked every bit the star of that 2014 World Cup team. It wasn’t just that incredible pass that earned New York Red Bulls winger Alex Muyl a mention here. He also broke the game open with a goal in the 15th minute and was electric down the right flank. Sure, the New England Revolution forward came up through the New York soccer scene, but Juan Agudelo started his journey in Barnegat, NJ. The striker opened his 2018 account with a headed goal that temporarily gave the Revolution a 2-1 lead over New York City FC. Sporting KC has allowed nine goals in its first three games and eight minutes this season. Last year, SKC allowed nine goals in its first 13 games. Seriously, I’m shocked by Kansas City’s defense. They returned with the 2017 goalkeeper of the year, Tim Melia. They feature the same back four (from left to right) of Seth Sinovic, Matt Besler, Ike Opara, and Graham Zusi that allowed the fewest goals in 2017 by a wide margin. It was a surprisingly effective performance from New England, whose high press almost secured three points from the previously perfect albeit depleted NYCFC. The Revolution missed a few first half chances, and the press was broken on both of City’s goals. Speaking of City— brutal blow losing midfielder Alexander Ring for a least a month. It was clear the club missed the Finnish international. He’ll be out for at least a month with a knee injury. New York’s other team has a forward who tallied his 88th and 89th goal in MLS. It’s time to ask if Bradley Wright-Phillips is the best scorer in league history. No, I did not watch the scoreless draw with a combined three shots on goal between the Whitecaps and the Galaxy. Neither should you. Good stuff Nick. I would say it bears mentioning that part of the schedule gap/congestion was MLS’ desire to “help” the CCL teams. Sure, Seattle crapped it up but it arguably helped 2 teams get to the semis.